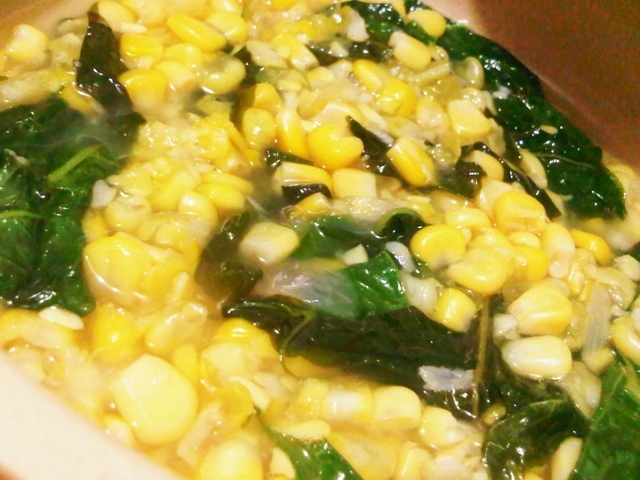 Suam na Mais is a Kapampangan fare using native sticky white corn or canned corn kernels. This dish is similar to cooking Guinisang Munggo. It’s very easy to make. 1. Heat oil. Saute garlic and onion. Pour in the 1st can of corn kernels including liquid/juice and let it boil until corn kernels are soft and can be mashed easily. 2. Remove pot from heat. Mash the corn kernels until a thick soup consistency is achieved. 3. Bring soup to a boil again, this time adding in the 2nd can of corn kernels. Let it boil for another 15 minutes. You may add water to adjust consistency to your liking (soupy or not too soupy). 5. Turn off heat and add chili leaves. Serve hot.